Apply a green color corrector sparingly to hide a reddish skin tone or imperfections. If you've struggled with covering acne marks, breakouts, hyperpigmentation, birthmarks or rosacea, you might be frustrated with the makeup options. It's particularly frustrating when expensive concealers and foundations fail to correct or conceal problem areas. A surprising product may rescue you from an uneven and red skin tone -- green color-correction powder. Green neutralizes red hues and imperfections on your face. Apply the concealer correctly and sparingly, so you don't leave the the house with a green-tinted face. Load a small to medium-sized makeup brush with the powdered green color corrector. Tap the brush against the powder container's lip to remove the excess product, because less is more when it comes to green-tinted makeup. Apply the color corrector only to problem areas. For example, if you suffer from ruddy skin along your forehead and nose, apply a thin coating of the color corrector only to these areas. Blend the product into your skin well with the brush to ensure that it stays put. A small amount goes a long way; experiment with the amount of color corrector to effectively conceal problem areas. Blend a cream concealer or liquid foundation over the green color-corrector powder. 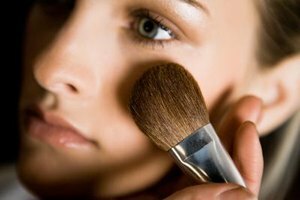 Use a makeup sponge or clean fingers to apply the concealer or foundation as you normally would. If the corrector is blended well, it will stay in place. Apply the rest of your makeup as usual. If the green color corrector isn't effective, apply a thicker layer or choose a different shade of green. Powder corrector is available in a variety of shades, from a light, frosty green to darker shades. Experiment to determine which works best with your skin tone. Color correctors are available in cream form, as well.